Go on a historical adventure through China on the high seas in 3 Kingdoms - Battle of Red Cliffs. This 3x5, 25 pay line video online uk slots is rich in Chinese charm and history. When the 3 generals Cao Cao, Liu Bei and Sun Quan clash look out for the big jackpot that can be won. Brought to you by Pragmatic Play, 3 Kingdoms, Battle of Red Cliffs is a very interactive, fast-paced slot with moving seas and ships in the background and colourful slot reels in the foreground. The beautiful oriental and historical theme isn’t enough to tempt you for a spin then surely the Spoils of War single player jackpot will. Join today ! Pragmatic Play was founded in 2007 and began as an online firm, providing software to casino sites. This was simple, download software in one language. Now the company offers integration of content from another platform, mobile gaming software and are successful in regulated markets where US-facing sites use their software. Their collection of games predominately includes slots and they have over 60 different slots available to players. Their slots vary in theme, play style and bonuses and jackpots available. When looking through their collection you can see that their games use sharp, beautiful graphics, easy to read and understand creating a fun and memorable gaming experience for players. https://www.easyslots.com has numerous games by Pragmatic Play available for you to play! 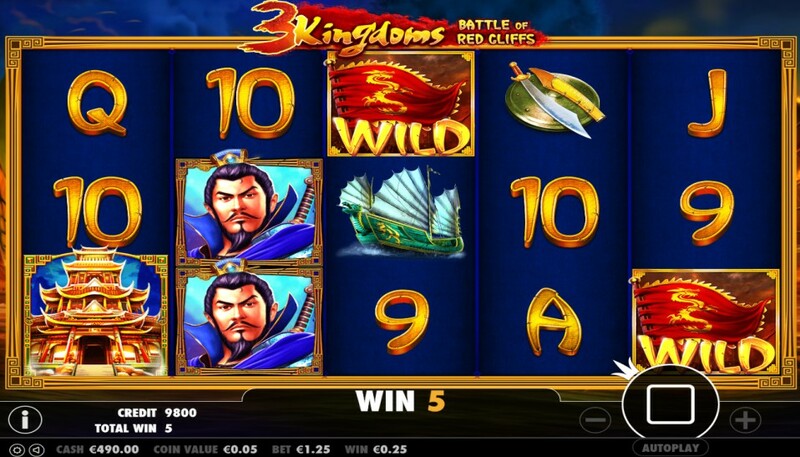 The 3 Kingdoms - Battle of Red Cliffs video slot allow players to sail the high seas and fight to win control of the reels. The game has beautiful 3D graphics and a beautiful background setting where you can see the sea and ships moving in the wind. Throughout the game, you will see the battle between the 3 Chinese generals Sun Quan, Lui Bej and Cao Cao. Your job is to win the cash games through the help of your troops and become victorious. But watch out because the powerful Chinese generals can and will do anything to stop you in your tracks. This slot doesn’t just have beautiful, high-quality graphics and animations but also some great ways to win cash. The symbols for this slot include the lower paying playing card symbols (9, 10, J, Q, K, Ace) which are worth between 30 and 40 coins when you land 5, not the reels, in one spin. Other symbols include a sword and shield, ship, feather helmet and the 3 rulers fo the kingdom Cao Cao, Lui Bei and Sun Quan. If you land 5 matching symbols you’ll receive a payment from 60 to 200 coins. The red flag is the wild symbol for this slot and can replace all other symbols other than the scatter symbol to help create winning combinations. The main feature in the base game is the Spoils of War Feature. This feature is activated when the players have enough points from the 3 rulers hit spins to win the feature. The price starts at 0 and gets increased by 2% for every bet. Once you reach 40 points, you will win the progressive prize and trigger the feature game. Once triggered, you will be shown between 1 and 8 envelopes to choose from. Inside these envelopes are multipliers from 2x up to 100x which will be applied to your progressive prize giving you a potentially big payout. The scatter symbol is the Chinese temple and when landing 3 or more of these symbol on reels 1, 3 and 5 you will trigger the Battle of Red Cliffs Free Round. When triggered, players get to choose from 3 available options: vanity, intrigue or all-out-war which are corresponding with 3 kingdom rulers. Vanity: The red ruler will become wild on reels 2 to 5 and gives you 20 free spins to use. Intrigue: The green ruler will become wild on reels 2 to 5 and gives you 10 free spins to use. All-Out-War: The green, blue and red ruler will become wild on reels 2, 3, 4 and 5 and awards 5 free spins. Landing 3 or more scatters in the bonus feature can also re-trigger the feature to potentially give you big wins. More free slots with free spins here. With a beautiful oriental, historic theme and plenty of great payouts, the 3 Kingdoms Battle of Red Cliffs is certainly worth a spin. So get ready for battle! If you enjoyed playing 3 Kingdoms - Battle of Red Cliffs why not try another online slots and start using mobile billing slot, find out more.